Microsoft is leaving nothing to imagination and trying everything to Bing across every web user. So besides refreshing daily wallpaper photo on Bing decision search, you can even get Bing on your mobile phone. bINg, biNg, binG, BING…. is what you will hear in official Microsoft Bing ringtones. Ringtones sound like jingle bells track but are cute to hear and smooth on ear. So if you are already a Binger, how about flaunting it on your mobile phone with official Bing Ringtones. 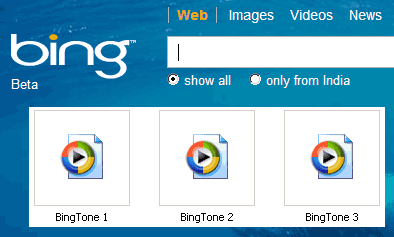 There are 3 Bing Ringtones in the download package – all has Bing Bing going in different tones. Download Bing Ringtones and hear out bing bing! A good idea to get people using their search engine and getting Bing out there for people to talk about. Its quite a good tone search service and the direct download capability is a nice break from trawling through adverts and spam.